Measuring your windows for Blinds, Shades or Interior Shutters is easy. Let’s start with a few general rules that apply to all of the window treatments that HOME DECOR sells. Remember: it’s best to measure TWICE and order ONCE. Rule 1. Always measure the exact window intended for the treatment. Every window opening is unique. Rule 2. Always use a steel tape measure or a quality laser measuring device. Never try to measure your windows with a cloth tape, ruler, or yardstick. Having a steel tape measure with 1/8th inch increments marked on tape will be a great help to you when measuring. Rule 3. Measure down to the nearest 1/8th of an inch and do not round up your measurements. Meaning, don't measure 35 3/8" and call it 35" or 36". Rule 4. When writing down your measurements, be sure to indicate which measurement is the width and which is the height and ALWAYS note the width first, then the height. A common mistake that customers make is transposing the numbers. Be sure not to get them backwards. Since these are custom made products, it's generally very hard to have a size modified and it can get costly to have them remade. 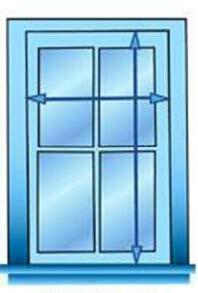 Your window is 34 3/8" wide by 58 1/4" high (tall). Think of it in these terms, Width is horizontal (horizon), left to right, and height is vertical, top to bottom. Your written measurements would look something like this... 34 3/8" x 58 1/4".